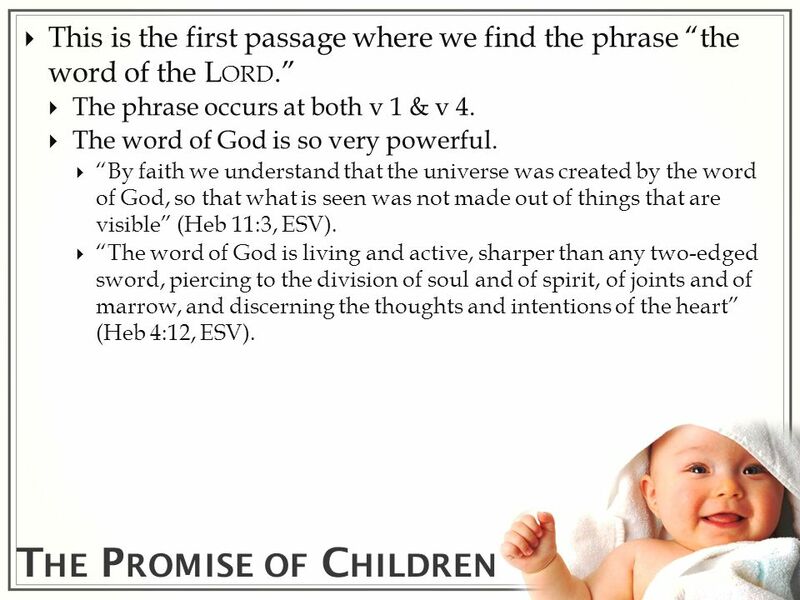 The Promise of Children Genesis 15:1-12. T HE P ROMISE OF C HILDREN Abraham was greatly concerned about his inability to produce an heir. The Lord had. 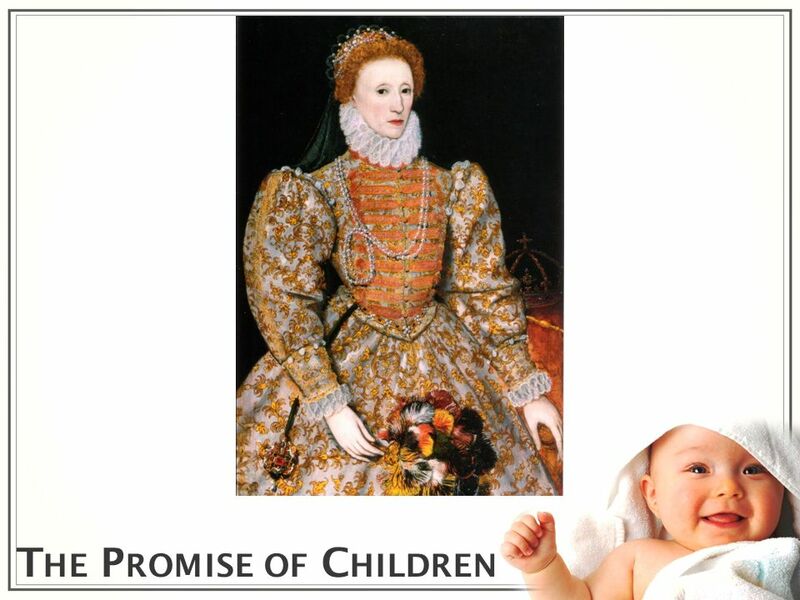 2 T HE P ROMISE OF C HILDREN Abraham was greatly concerned about his inability to produce an heir. The Lord had promised to provide an heir for Abraham. I will make of you a great nation (Gen 12:2, ESV). While Abraham was sojourning in Canaan, the L ORD appeared to Abram and said, To your offspring I will give this land (Gen 12:7, ESV). But, Abraham was 75 years old when God made these promises (Gen 12:4)! Now, at some future point, Abraham is waiting for God to award him with that heir. 3 T HE P ROMISE OF C HILDREN In this mornings text, Abraham is waiting for God to award him with an heir. Gen 15:1-6. As Abraham awaits his heir, he learns a great deal about God. 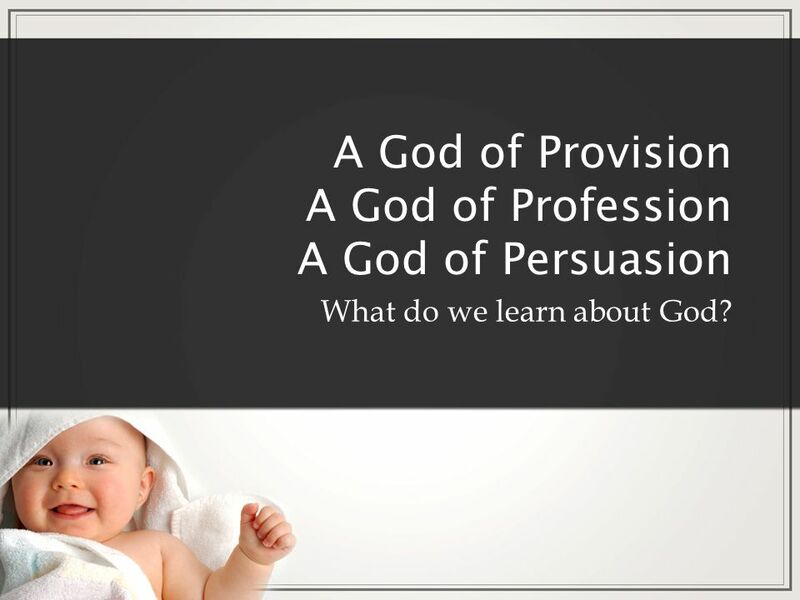 4 A God of Provision A God of Profession A God of Persuasion What do we learn about God? 6 T HE P ROMISE OF C HILDREN God comes to Abram as A Good of Provision & promises to provide for him. After these things the word of the L ORD came to Abram in a vision: Fear not, Abram, I am your shield; your reward shall be very great (v 1, ESV). 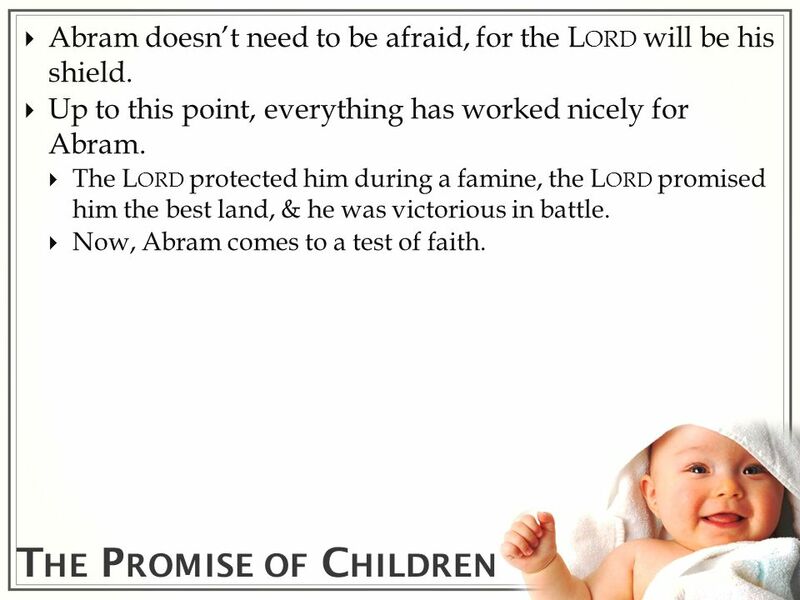 7 T HE P ROMISE OF C HILDREN Abram doesnt need to be afraid, for the L ORD will be his shield. 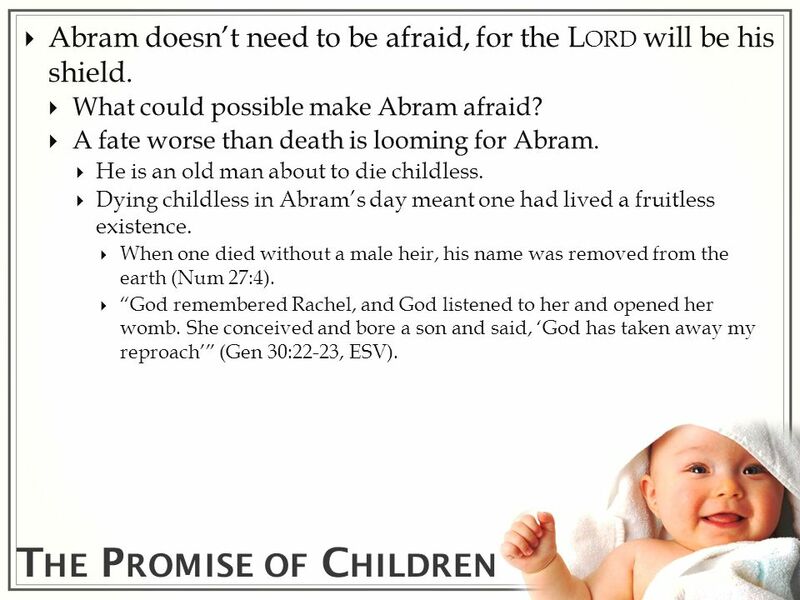 What could possible make Abram afraid? A fate worse than death is looming for Abram. He is an old man about to die childless. Dying childless in Abrams day meant one had lived a fruitless existence. When one died without a male heir, his name was removed from the earth (Num 27:4). God remembered Rachel, and God listened to her and opened her womb. She conceived and bore a son and said, God has taken away my reproach (Gen 30:22-23, ESV). 8 T HE P ROMISE OF C HILDREN Abram doesnt need to be afraid, for the L ORD will be his shield. Up to this point, everything has worked nicely for Abram. The L ORD protected him during a famine, the L ORD promised him the best land, & he was victorious in battle. 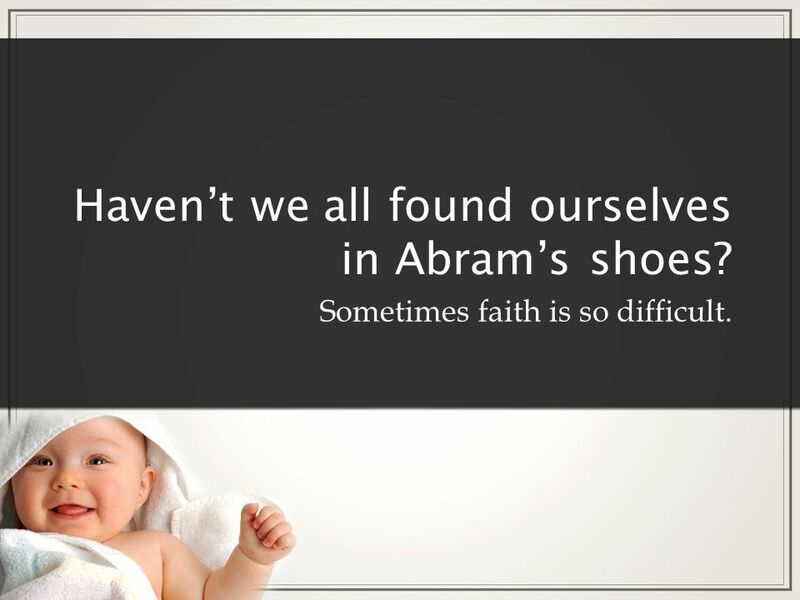 Now, Abram comes to a test of faith. 9 T HE P ROMISE OF C HILDREN The L ORD will be Abrams shield by richly rewarding him. The very idea of a reward indicates that one has acted in such a way to receive the reward. 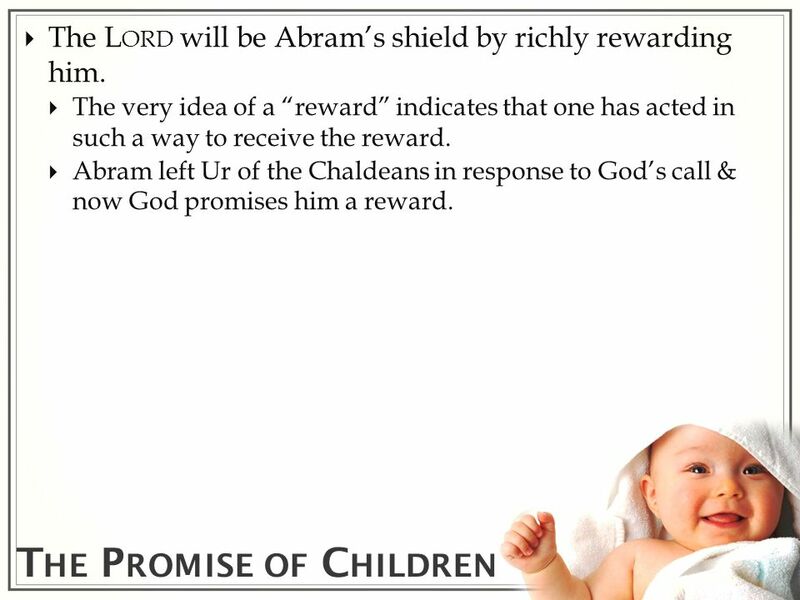 Abram left Ur of the Chaldeans in response to Gods call & now God promises him a reward. 10 T HE P ROMISE OF C HILDREN The Lord has always been A God of Provision. I have fought the good fight, I have finished the race, I have kept the faith. Henceforth there is laid up for me the crown of righteousness, which the Lord, the righteous judge, will award to me on that Day (2 Tim 4:7-8, ESV). Be faithful unto death, and I will give you the crown of life (Rev 2:10, ESV). 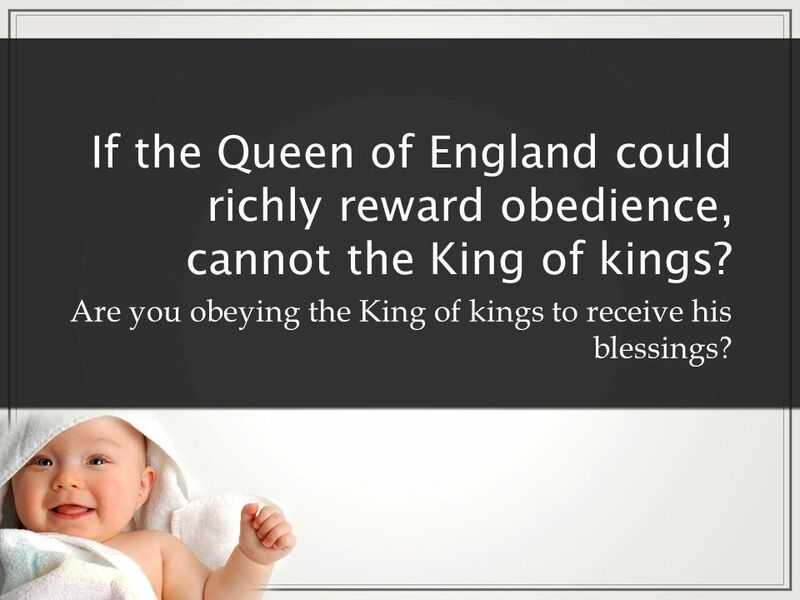 12 If the Queen of England could richly reward obedience, cannot the King of kings? Are you obeying the King of kings to receive his blessings? 14 T HE P ROMISE OF C HILDREN God is A God of Profession, for he is a God who makes abundant promises. But Abram said, O Lord G OD, what will you give me, for I continue childless, and the heir of my house is Eliezer of Damascus? And Abram said, Behold, you have given me no offspring, and a member of my household will be my heir. And behold, the word of the L ORD came to him: This man shall not be your heir; your very own son shall be your heir. And he brought him outside and said, Look toward heaven, and number the stars, if you are able to number them. Then he said to him, So shall your offspring be (vv 2-5, ESV). 15 T HE P ROMISE OF C HILDREN God has just promised that Abrams reward would be very great. 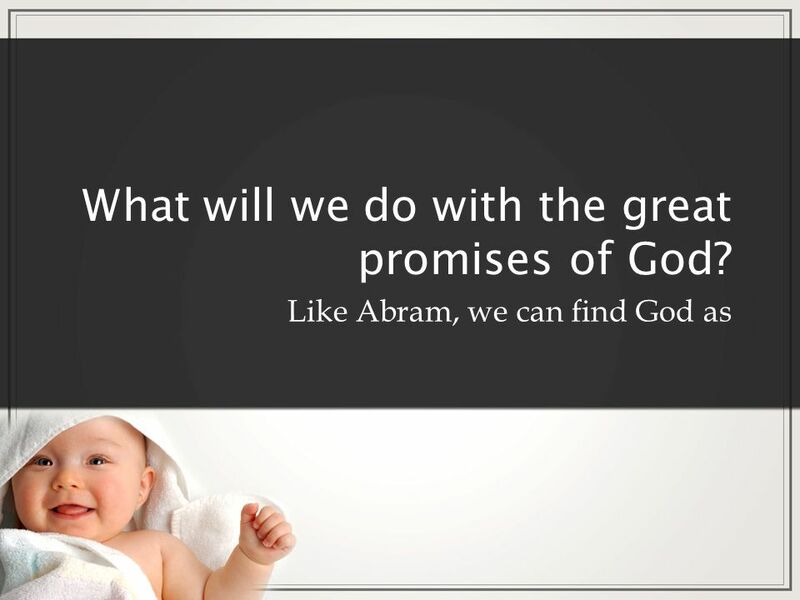 The L ORD has already promised to make of Abram a great nation (Gen 12:2). 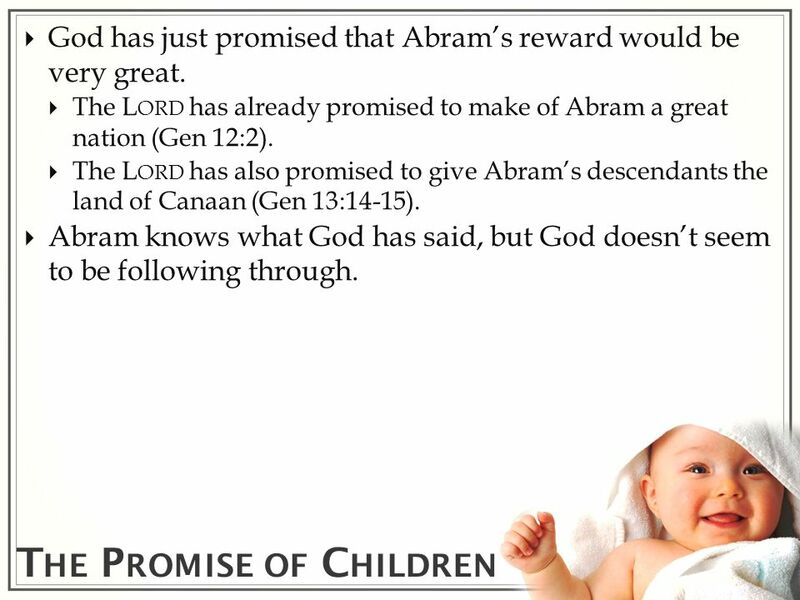 The L ORD has also promised to give Abrams descendants the land of Canaan (Gen 13:14-15). 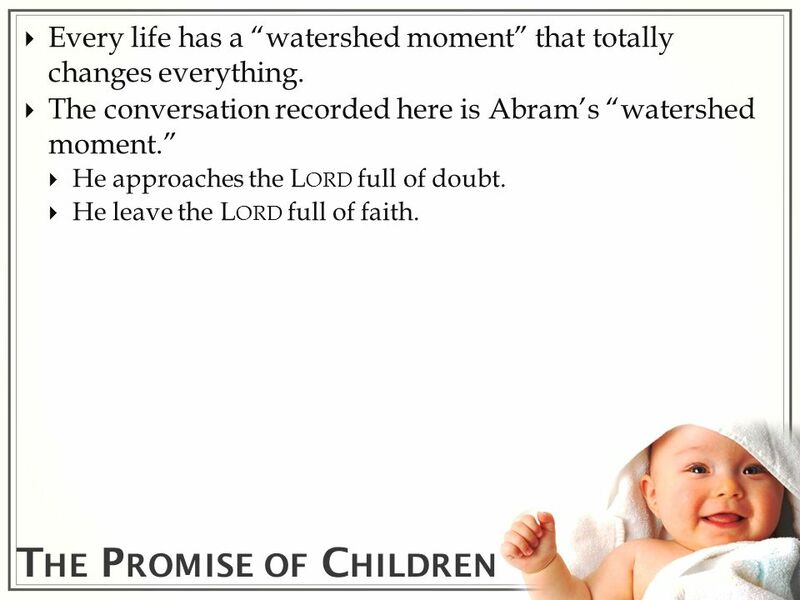 Abram knows what God has said, but God doesnt seem to be following through. 16 Havent we all found ourselves in Abrams shoes? Sometimes faith is so difficult. 17 T HE P ROMISE OF C HILDREN This is the first passage where we find the phrase the word of the L ORD. The phrase occurs at both v 1 & v 4. The word of God is so very powerful. By faith we understand that the universe was created by the word of God, so that what is seen was not made out of things that are visible (Heb 11:3, ESV). The word of God is living and active, sharper than any two-edged sword, piercing to the division of soul and of spirit, of joints and of marrow, and discerning the thoughts and intentions of the heart (Heb 4:12, ESV). 18 T HE P ROMISE OF C HILDREN That powerful word promises that Abrams own son will be his heir. The ESV reads, Your own son, while the KJV reads, he that shall come forth out of thine own bowels shall be thine heir. The Hebrew bowels refers to the reproductive organs. Abram doesnt need to look for an heir. He will have a son who will be an heir. 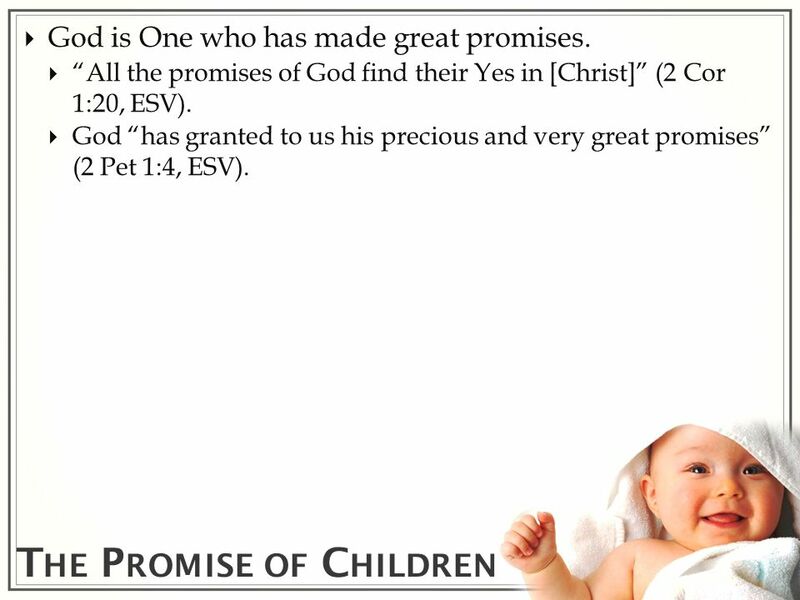 20 T HE P ROMISE OF C HILDREN God is One who has made great promises. All the promises of God find their Yes in [Christ] (2 Cor 1:20, ESV). God has granted to us his precious and very great promises (2 Pet 1:4, ESV). 23 T HE P ROMISE OF C HILDREN God is A God of Persuasion in that we, like Abram, can believe Gods promises. Abram believed the L ORD, and he counted it to him as righteousness (v 6, ESV). 24 T HE P ROMISE OF C HILDREN Every life has a watershed moment that totally changes everything. The conversation recorded here is Abrams watershed moment. He approaches the L ORD full of doubt. He leave the L ORD full of faith. 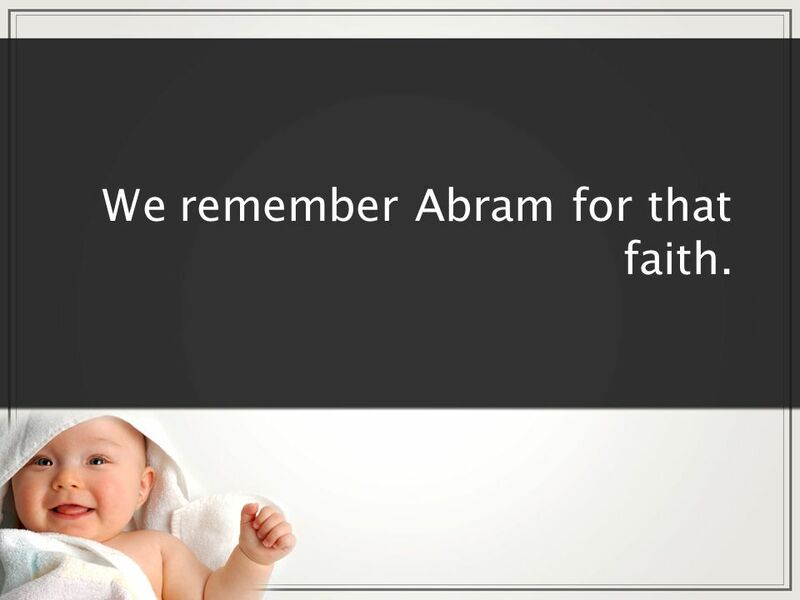 25 We remember Abram for that faith. 26 T HE P ROMISE OF C HILDREN In hope he believed against hope, that he should become the father of many nations, as he had been told, So shall your offspring be. 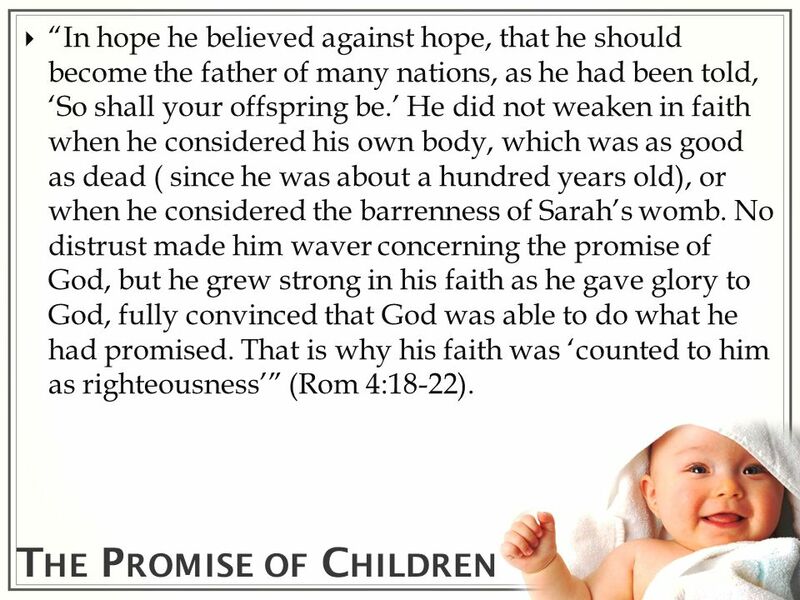 He did not weaken in faith when he considered his own body, which was as good as dead ( since he was about a hundred years old), or when he considered the barrenness of Sarahs womb. No distrust made him waver concerning the promise of God, but he grew strong in his faith as he gave glory to God, fully convinced that God was able to do what he had promised. That is why his faith was counted to him as righteousness (Rom 4:18-22). 27 T HE P ROMISE OF C HILDREN Just as Abraham believed God, and it was counted to him as righteousness[.] Know then that it is those of faith who are the sons of Abraham. And the Scripture, foreseeing that God would justify the Gentiles by faith, preached the gospel beforehand to Abraham, saying, In you shall all the nations be blessed. So then, those who are of faith are blessed along with Abraham, the man of faith (Gal 3:6-9, ESV). 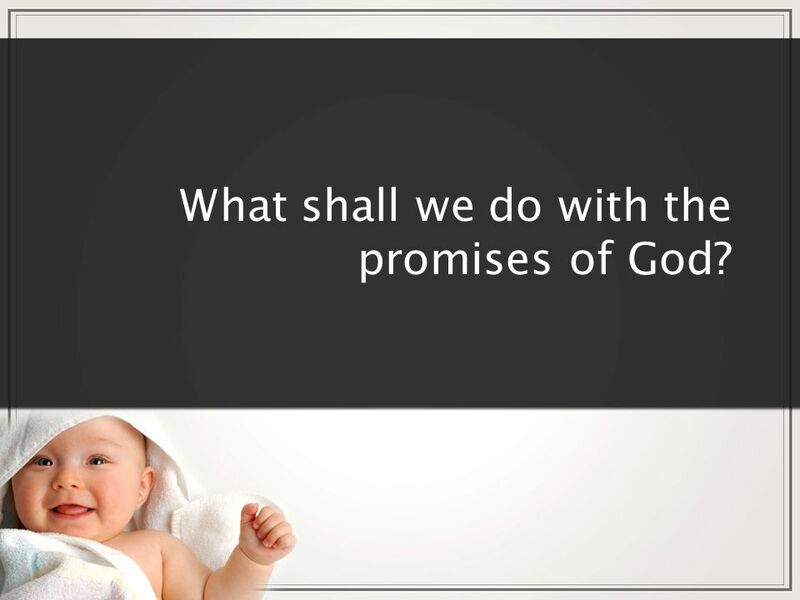 28 What shall we do with the promises of God? 29 T HE P ROMISE OF C HILDREN Because Abram believed the L ORD, God richly rewarded him. Do you stand in need of that righteousness God imputes to the righteous? 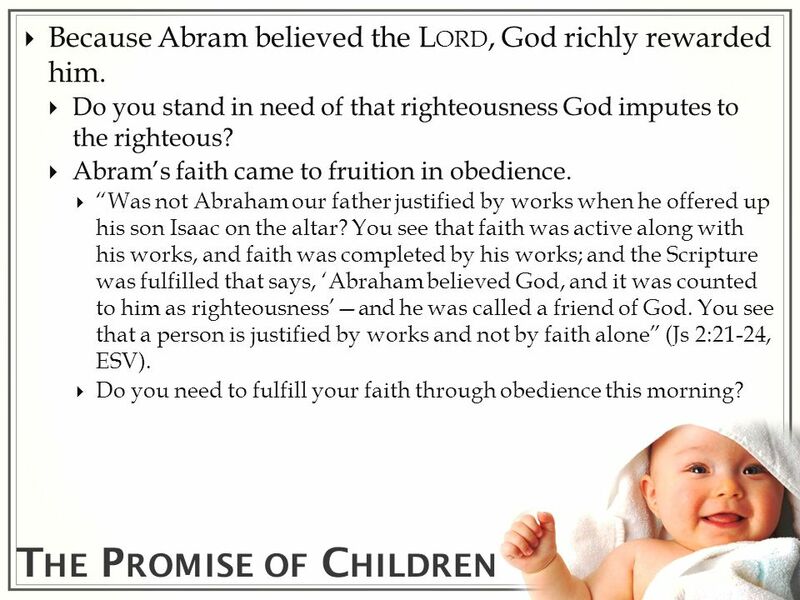 Abrams faith came to fruition in obedience. Was not Abraham our father justified by works when he offered up his son Isaac on the altar? You see that faith was active along with his works, and faith was completed by his works; and the Scripture was fulfilled that says, Abraham believed God, and it was counted to him as righteousnessand he was called a friend of God. You see that a person is justified by works and not by faith alone (Js 2:21-24, ESV). Do you need to fulfill your faith through obedience this morning? 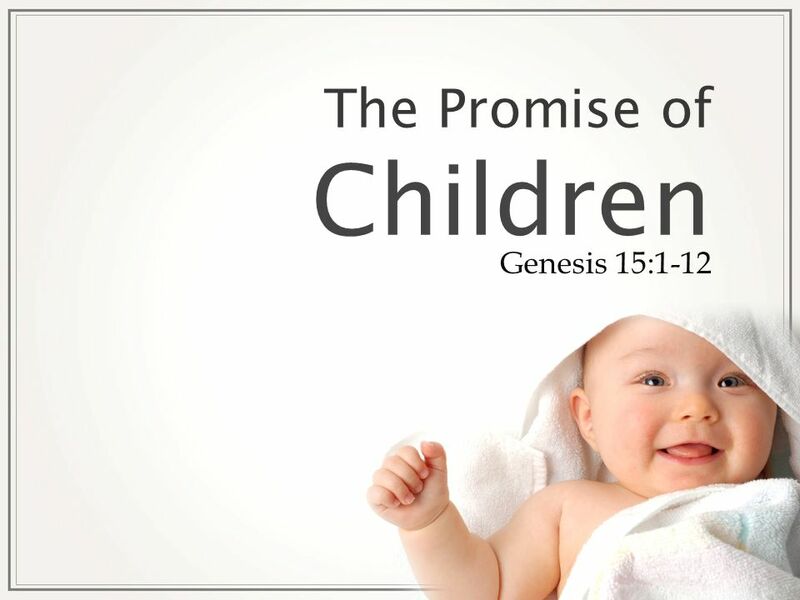 Download ppt "The Promise of Children Genesis 15:1-12. 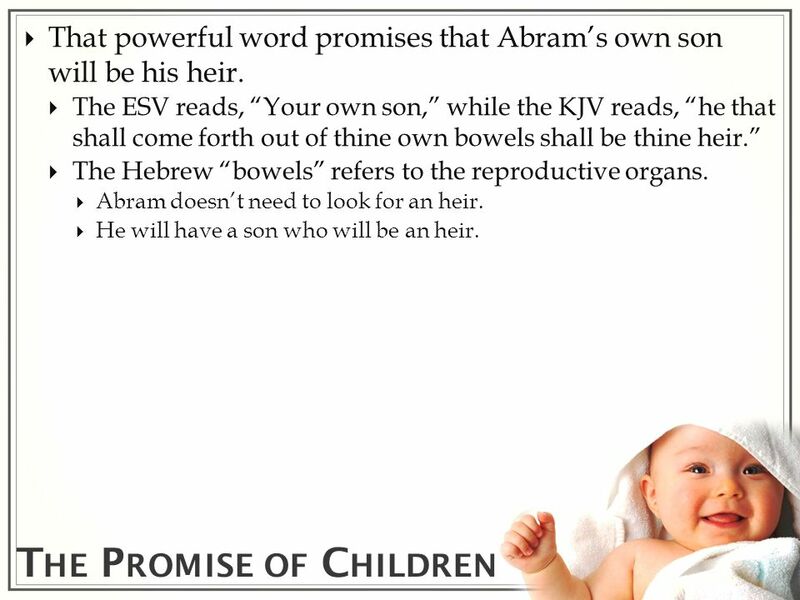 T HE P ROMISE OF C HILDREN Abraham was greatly concerned about his inability to produce an heir. The Lord had." Galatians 3: Brethren, I speak in terms of human relations: even though it is only a mans covenant, yet when it has been ratified, no one sets. The Faith of Our Father Or, Not Your Daddy? To 160 th Ave Church of Christ. Patience Towards the Promises of God. A Promise Out of the Blue Genesis 15:1-21. The LORD had said to Abram, "Leave your native country, your relatives, and your father's family, and go to. Faces of Fear: Do-Overs The Life of Abraham. Faces of Fear: D0-Overs 2 Key Things 1. Our ego affects our feelings 2.Guilt vs. Conviction -Guilt comes. 1 After this the word of the Lord came to Abram in a vision; “Do not be afraid, Abram. I am your shield, your very great reward.” “Do not be afraid, Abram. Abraham – Father of Faith Part 4 – God Makes a Covenant With Abraham. ABRAHAM STAGGERED NOT ROMANS 4:19-24. God Is Faithful Faithful? Faithful companion? Faithful Friend.